Six Month Smiles has revolutionized cosmetic dentistry and provides you with a faster, less expensive, and often more effective way to dramatically improve your smile. Until now, the Invisalign straightening method or veneers were the main tooth straightening options for adults. 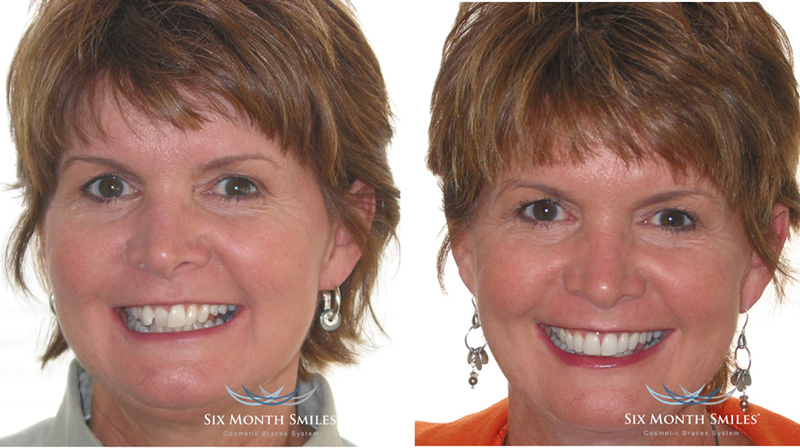 Six Month Smiles now offers an effective, comfortable, and quick third option. Unlike most dentists, Dr. Stephen Raisman is certified in both Invisalign and Six Month Smiles, and is uniquely qualified to advise you on the best treatment for your situation. The Six Month Smiles treatment involves the use of small, tooth colored brackets which are barely visible compared to traditional braces. They are attached by a thin, tooth colored wire across the front teeth. The wire applies gentle forces to reposition the teeth and transform your smile. Because Six Month Smiles uses fixed brackets, as opposed to Invisalign’s removable aligners, it is often easier and faster to attain the desired outcome using the Six Month Smile system. The results can be remarkable. 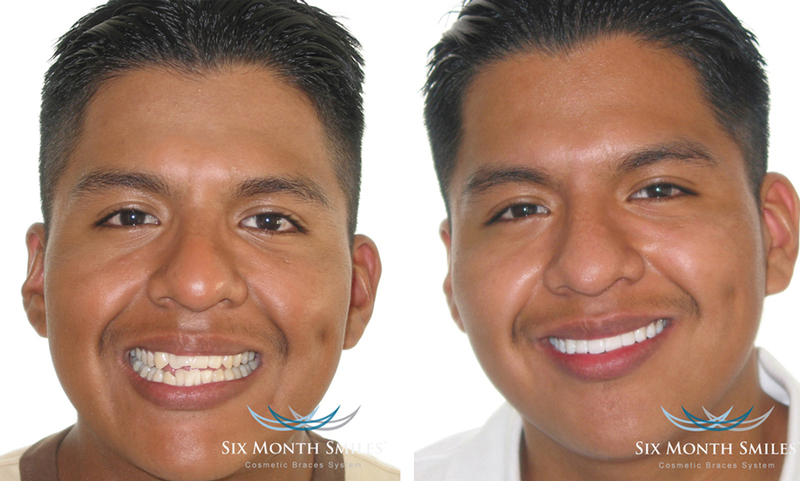 At the Framingham Dental Center we have had patients who claim that the Six Month Smiles treatment has literally changes their lives. A lifetime of concern about their smile vanishes in just six months. As a stand alone treatment the results can be dramatic. Combined with other simple cosmetic dentistry procedures the results can be absolutely remarkable. 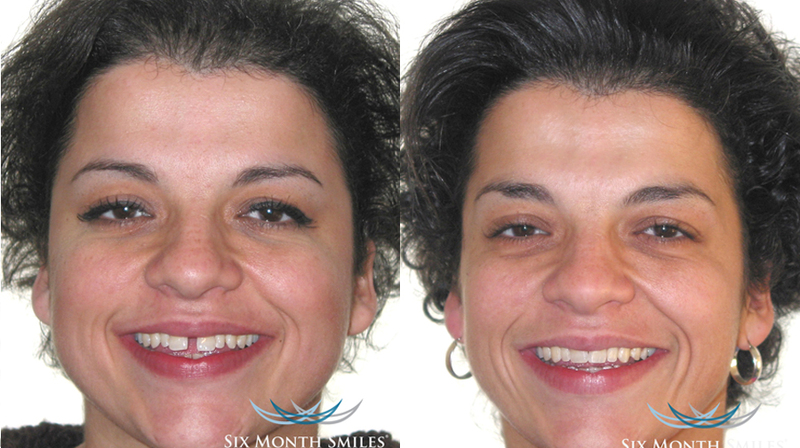 Six Month Smiles is currently among the fastest straightening treatments available. Invisalign treatments generally last between 9 and 18 months, depending on the case. Traditional orthodonture treatment can last several years. 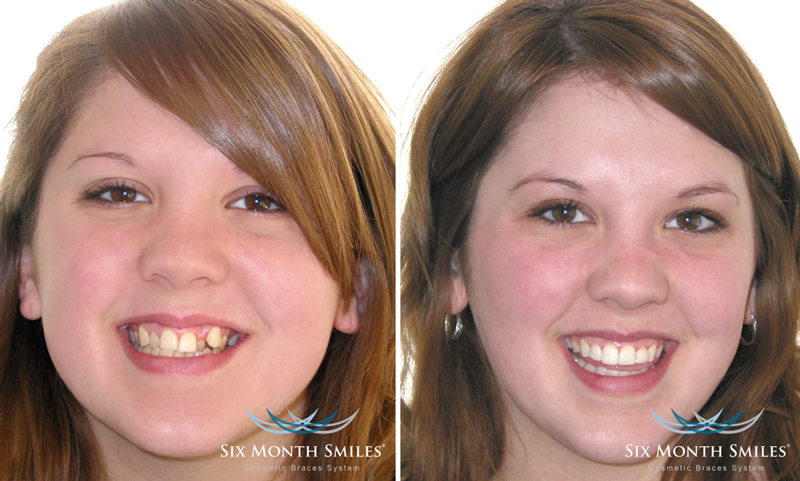 As the name implies, the Six Month Smiles system is designed to work in just six months! Both Invisalign and Six Month Smiles can be extremely effective. Your choice of treatment depends on many factors. Before deciding what treatment is best you need to have a dentist who is qualified in both methods and familiar with all your options. 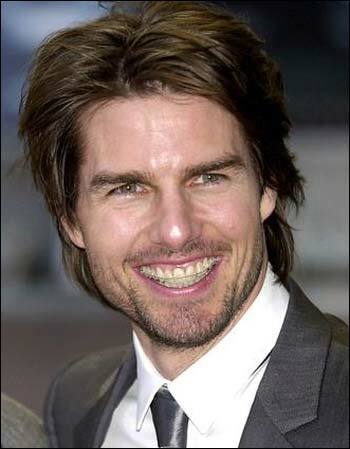 Actor Tom Cruise sporting the Six Month Smiles System. Six Month Smiles is so good, even the stars use it! Despite its effectiveness, the Six Month Smiles system can be substantially less expensive than Invisalign. The materials and lab work necessary for Six Month Smiles are less costly than Invisalign, and those savings are passed on to the patient. Unlike most things in the life, the better treatment for many people is actually the less expensive option! Click Here to arrange a free evaluation by Dr.Stephen Raisman at the Framingham Dental Center. There is no obligation. Dr.Raisman will evaluate your case, explain your options, and patiently answer any questions. Whatever option you choose, and whatever dental professional you ultimately decide upon, you should carefully explore all your options. Dr.Raisman is in a unique position to give you the information you need. I recently had a cleaning and Tiffany was my dental technician. She was very gentle and yet very thorough; she explained what she was going to do and why she was going to do it before doing it. She always checked to see if I needed a break and really was professional and caring. Dr. Raisman did his follow up and was his usual professional and caring self. I would definitely recommend FDC and Tiffany as a dental technician. I can't thank you enough for taking me at the last minute. Dr. Raisman did an outstanding job, especially since he saved me from having a root canal!! His assistant was wonderful and explained everything they were doing. Thank you again. My son had to have two baby teeth removed. My questions were answered quickly and professionally. We went right back without waiting and were done in about 30 minutes. The dentist came out to let me know how it went and what we should do for follow up. When I go to Framingham Dental, I feel like a part of their family. They are excellent practitioners, up-to-date on the latest techniques and technology and extremely nice people. Very professional from the second you walk into the office. Highly, highly recommended! High quality service, professional and friendly. I did not have to wait. Very thorough cleaning. Excellent examination. If you to go to the dentist this the only place to go! Great professional staff pleasure to deal with. Every experience is awesome! While having to visit the dentist may not be what we look forward to (I actually do look forward to it here! ), they always make it such a pleasant experience. The atmosphere is warm and welcoming. My family has been going to Framingham Dental Center for decades and we have referred others because we know they will also have a great experience. Everyone is kind, considerate and caring. They take really good care of their patients! Bravo! to the entire team! As always, my visit was very professional and problems were addressed thoroughly. X-rays were taken on the three problem areas and results were handled accordingly in a very efficient manner. New technology made my visit a positive experience. Staff are always upbeat and very pleasant. I've been coming for so many years and the staff and doctor are always so nice. Love the changes in the office too! As a first time patient I was nervous but I was received very warmly by the front desk, assistant and Dr. K... i need a few things done and feel confident and relaxed that i'm in good hands. Dr. K was very down to earth. She explained things and the course of action in a way that didn't make me want to run for the door!! I believe I made the right decision. I am always treated with respect and everything is explained to me so I always know what is happening. This is a professional office. Anyone I have had contact with has treated me with professionalism. I have never had a bad experience in that office! Framingham Dental Center is by far one of the most professional facilities I have ever been a customer of. The staff is absolutely remarkable and everyone is friendly, genuine and kind. I recommend this place to everyone I know - truly, one of the best places around. This visit was to take an impression of my teeth was a view to obtaining an implant crown. Visit was unrushed and care was taken take a good impression. Considerable time was taken to select a color for the new tooth and I was shown a number of color options to choose from. I could not be happier with Framingham Dental and everyone that works there. From the moment you walk in to the time you leave it feels like family. You are treated with the utmost respect and my teeth look and feel great! Dr Raisman is awesome and takes pride on a job well done. He goes above and beyond ... What a winning team. After years not going to the dentist the staff at Framingham Dental makes it so easy and painless. I go for all my regular appointments Lisa is always on time does a complete cleaning and informs me of things I might need in the future. What a great staff give them a try it will not be disappointing> I would give six stars if it would let me. I actually look forward to visiting this dental office! And, if your teeth are crooked, ask about straightening them. It works! I highly recommend Dr. Raisman and his staff. As always, my experience at Framingham Dental was excellent. The level of care was extensive and everyone was kind and caring. I have been a long time patient. I came here from another dentist in the area and would never go anywhere else. The staff is outstanding and make you feel like family. I would highly recommend this practice to so many others. All of the employees are very professional and friendly! I've never had a negative experience at this office. Dr. Raisman always explains what he's doing and makes sure I'm comfortable. I highly recommend Framingham Dental Center! Catherine is awesome- she is clearly a perfectionist and does such an excellent job taking care of my teeth and gums. She knows when I need a rest and is very attentive to my comfort level. Just what you need at the dentist. Always such a pleasure to go to the FDC! Who can say that going to the dentist is actually "pleasant?!" Great team of warm, welcoming, caring professionals. I have squeaky-clean teeth and it was almost like getting an oral massage! Lisa is the best! Nobody *wants* to get two fillings- at the same time- in molars- the day before Christmas... but Framingham Dental Center made it the least miserable experience it could possibly be. It was fast and efficient...Dr. Knudsen spent a lot of time after the filling was in place, and I really I appreciated that she was being very careful and particular about getting my teeth just right so that I could avoid problems later. I've been a patient at FDC for over ten years and I have had great experiences. I visited this morning as a new patient needing to have a cracked filling repaired and an exam. Everyone from the front desk associates to the dentist were all very pleasant. I was recommended to the practice from a friend but will continue because of todays experience. Hello, I've been going to Framingham Dental for just over two years, and the service and care have been fantastic. If anyone is looking for a new dentist, I highly recommend Dr. Raisman and his team. The entire staff at Framingham Dental is very kind, accommodating and welcoming. They always make you feel as comfortable as possible during every procedure. Both my boys have always had a positive experience. I've never been a fan of going to the dentist. This is as good as it gets! The hygienists are excellent and Dr. Raisman is the best. I highly recommend this practice to everyone! Good competent people doing good work. Staff was friendly,knowledgeable and very helpful. The technician who took the x-rays was friendly and professional. Dr. Raisman was friendly extremely knowledgeable and honest. I was very happy with my visit. My appointment was on time and my filling in my front tooth looks perfect. The office staff is very efficient and friendly. Everything has been thought through from the confirmation of the appointment via email and text, to the amazing on-site experience to the post visit survey. I know I am in good hands. I have been a patient here for 30 years, long before Dr. Raisman arrived. The care I have received and continue to receive under Dr. Raisman and his staff is excellent! Added bonus: I have never had to wait beyond my scheduled appointment time. I had an excellent experience yesterday. I called for a last minute appointment and got it when I needed it. I was taken immediately and Dr. Raisman as always professional,. He fixed a chip on a front tooth, completely painless and a beautiful job. Also his staff is very professional and friendly. I would highly recommend Framingham Dental Center. The whole staff is friendly, helpful and knowledgeable. Dr. Stephen Raisman explains exactly what he will be doing step by step and makes you feel very calm and comfortable, even if you have a strong fear of dentistry. Catherine the Hygienist is compassionate and awesome, as is Lexine the Office Manager. The use of the most cutting edge technology is amazing (filling to permanent crown in one appointment). Best dental practice ever! The office is clean and the staff is always personable! Before I met Dr. Raisman over 13 years ago, I honestly never liked going to the dentist and hadn't been for years. Now I know having to go to the dentist will always be quick and painless. I actually enjoy going! I was very pleased by the professionalism in designing and milling my new crown. Your very modern equipment made it possible to complete my new crown the same day, in about 2 hours. I did not have to have a temporary one and did not need another appointment. The entire Staff is very professional and accommodating not to mention their technical capabilities. Dr. Raisman is terrific. I am always confident when performing his dental artistry on me. He seems dedicated to motivating his staff to embrace and practice new technologies in all dental procedures as well as in office operations. The electronic patient reminders as well as the new follow up survey tools like this one are just another example of a new type of client outreach that serve to connect patients even more to his Practice. I always enjoy my visits. Everyone is so friendly - from Lexine and her staff at the reception desk to the hygienists. As always, the service and professionalism of my dental hygienist was great! I had a fiiling and crown installed today. I am not a hero, but did not need novocain for either procedure. It is a tribute to Dr. Raisman's ability and skill level. He makes you feel very relaxed. Both procedures went well. I was able to see firsthand his new high-tech state-of-the-art crown making equipment. In about an hour and 15 minutes I had my filling and new crown. Because of this new procedure I did not need a temporary crown, and it saved me an extra visit. I was fortunate to be able to watch entire crown making procedure. It was very impressive. Everything about my appointment went very well. Everyone was very helpful and positive. Dr. Raisman and his professional, compassionate staff made my visit comfortable and as pleasant as a "trip to the dentist" can be. Their onsite ability to design, fabricate and attach a seamless crown to my molar is most impressive. It all took place in less than two hours instead of several weeks. Thanks for such attention to detail and for preserving my precious teeth. Catherine is awesome! Very compassionate, friendly and professional. She takes the extra steps to make you feel comfortable. Everyone in the office is very nice and welcoming. 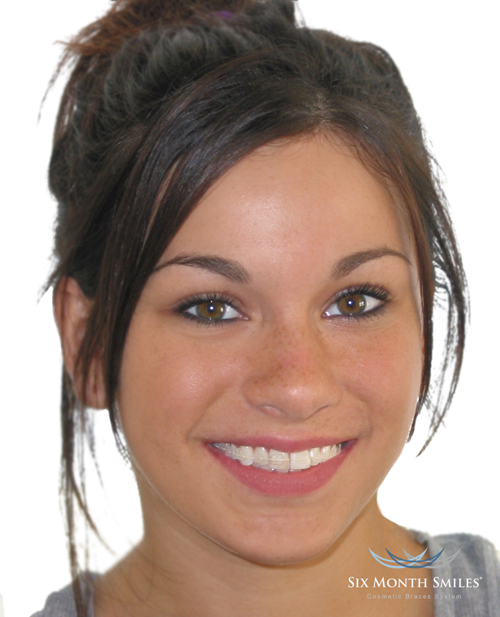 The Staff and Dr. Raisman at Framingham Dental Center take the pain out of office visits. I feel welcome and treated with care and respect. When I have a procedure done, I am frequently asked if I feel any pain, which I general do not. State of art dental equipment. Aside from quarterly ultrasonic teeth cleanings, I had a successful tooth implant completed last year. Will have a crown procedure that will take a total of two hours from start to finish. The crown will be made in the office. No need to return for fitting. Ever time I visit Framingham Dental Center, I leave with grateful appreciation for both the exceptional competence of the team and the pleasant demeanor they bring to the task. Jessica always does a great job and I would highly recommend her, Dr. Raisman, and the entire operation. My routine cleaning appointment was a most pleasant experience. Everyone is professional, friendly and helpful. This office continues to amaze me with the very latest equipment and procedures. I'd rather have a cleaning than a pedicure. A dental office doesn't get any better than this practice! My semi annual cleanings are like a visit with family! This team of professionals are wonderful, caring and an amazing group. I not only would, but have recommended this practice to many friends who have been happy with their care as well. The personnel and level of care are always phenomenal. Timely, professional and with a great personal touch. The staff is very professional and knowledgeable. The sitting area very pleasant. The patient offices are very clean and the instruments are all state of the art. Dr. Raisman is a great dentist. He always explains what he is doing and will never perform unnecessary procedures. You do not even feel it when he is doing a filling or root canal. Dr. Raisman and his incredible staff are thorough, caring and friendly. In addition to knowing that I am getting quality care and state of the art technique, every appointment has been positive and enjoyable! Lisa is friendly, skilled, thorough and professional. I look forward to seeing her for my cleanings. Received a very thorough cleaning and a lot of good advice and tips on how to care for my teeth. Thank you! Staff is ALWAYS friendly and helpful. This office respects your time and your individual needs. Quality of care is top notch. Dr Raisman and his staff always make you feel special I have had lots of dental work over the past couple years and Framingham Dental always does a great job, Crazy to say I look forward to my 4 visits a year. I've been going to Framingham Dental for almost 10 years and remain completely satisfied with their services! It is one of the friendliest offices I visit and the care provided is top notch! Thank you, Dr. Raisman and Staff! I love the staff - they are so professional and friendly. They know who I am and care. Thanks for having such a fine office of Dentists and Hygienists! My session with Catherine was a prime example of expert professionalism and pleasant, attentive treatment! I'm also grateful that you're located so close to my home! I had my crown fall off in the morning and when I called I was able to get an appointment that afternoon. They re applied my crown with no issues. made sure it was properly fitted and comfortable . The office staff and all dental workers there are always kind and friendly. I have always had good experiences there and the Doctors are very competent. I would recommend this office to anyone who is looing for good dental care and professional results. The customers best interest is at heart here. I'm glad my friend referred me to them - referrals are the best way to find a new doctor in my opinion. I am not disappointed I chose Framingham Dental Center! Awesome staff, so friendly and caring. My cleaning was perfect. Visiting FDC is always so pleasant. Everyone is professional and very competent from Dr. Raisman to his entire team. He wouldn't have it any other way and they wouldn't either! I had a dental emergency during a recent snow storm. I called the next day and they were able to get me in and solve the problem that afternoon. Everyone is so nice there and accommodating esp for people like myself who don't do well at the dentist ! No waiting, everything went fine and had a nice conversation with the ladies at the desk. Had great time during my dental cleaning! I have been a patient for 9 years and I have had only positive experiences. The dental hygienists are meticulous and professional. The doctors are excellent as well. It has taken some time but with Dr. Raisman's help my mouth, teeth, and gums are getting back into shape. I have full confidence in Dr. Raisman. He is enthusiastic, efficient, concerned, great chairside manor, and keeps up with the latest techniques. He truly loves dentistry, you can tell, and still seems to find it stimulating and challenging even though he is a master of his craft. I would highly recommend Dr. Raisman and his staff both admin and clinical. He has a very successful practice and it is obvious why. This dental practice has the latest modern technology has to offer, the entire staff makes you feel welcome and relaxed. We have been going here for years and have recommended others do the same--a very positive experience! I am very happy with Framingham Dental Center. The administration, technicians and dentist are very observant and caring to your needs. I would highly recommend this practice. Dr. Raisman was dealing an emergency when I arived for my initial evaluation as a new patient, the staff informed me of the situation that would cause a delay in my being seen. I thought it was handled very well with only a small delay. My evaluation was very thorough and informative. I would highly recommend Dr. Raisman's Dental Practice. I was seen on time. Dr. Raisman explained clearly all of the options to address my dental problem. He did not rush me in any way. I had a wonderful experience here. As soon as I walked in the three women at the front desk introduced themselves and welcomed me. Dr. Raisman was very thorough and very kind. He went above and beyond my expectations and I couldn't be happier. Everyone in the office is so friendly and kind, from the receptionists to the hygienists to the dentist. I only come twice a year (usually) but it still feels like I know everyone and it is a very comfortable environment. I would enthusiastically recommend Framingham Dental Center to anyone! 5 Stars! I am very pleased with the office employees and the care I receive at your practice. An Outstanding practice!!! I'd give it 5 Stars! Recommend Dr. Raisman without reservation. Always clear about explanations and treatment, patient, friendly, knowledgeable, and on time. Good appt reminders and options. "Growing up, I had always been unhappy with my smile. However, with my wedding coming up next year, I knew it was finally time to do something about it. The decision to do Six-Month Smile with Dr. Raisman was one of the best decisions I've ever made. My case was rather complicated, but Dr. Raisman and the wonderful staff at Framingham Dental Center were patient and caring, explaining to me the process every step of the way. Now, I can smile for my wedding photos without reservation or hesitation - a gift for which I am extremely grateful." "Amazing Experience The entire staff blew me away. From the moment I walked in the door, to when I left, everybody had a smile on their face, which aside from being appropriate for a dentist office, was a very welcome site. They were warm genuine smiles of people enjoying what they were doing. I was blown away by everybody in the office from the folks out front to the folks in the back so to speak. I went into the office dreading the experience, and not only was it the opposite of what I was expecting, but also I look forward to my next visit." "I love love love everyone at Framingham Dental. They are like family :)"